On the next day newspaper headlines barely mentioned of a brawl at the national stadium. But that incident later proved to be Russian football’s most tragic disaster. 66 people were killed, at least officially. Unofficially the toll may stand at up to 350. October of 1982 was cold. 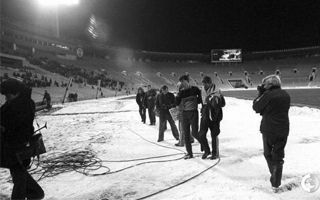 Most of the Lenin Stadion, simply known as Luzhniki, was covered with snow. There was no roof at that time (wasn’t installed until 1990s) and there was no need to use all of the vast seating bowl. The game between Spartak and HFC Haarlem was nowhere near filling the stadium able to hold 100,000, not in these adverse conditions. Estimates give that night’s attendance at 15,000. Only the west sections were fully opened. One of the only photos from that evening. No footage of the actual tragedy was ever released to the public. According to official announcements the tragedy unveiled late into the game, when Spartak scored their second goal. Many fans were already flocking to the only opened exit gate. It was understandably crowded and at one point someone or a group collapsed, causing a domino effect, pushing others down as well. With no escape, people were simply crushing one-another with their bodies. How did that happen? Soon after the tragedy there were news releases suggesting that the “accident happened due to some fans’ incompliance to safety rules”. Not all outlets even mentioned there were casualties. The game saw some disorder, though mostly minor incidents like snowball throwing. Reportedly people were using various methods to stay warm – some were running around, some drinking vodka. Henk van Gelderen, Dutch ambassador to Moscow at the time, confirmed there were even fights between fans and officers. But the theory of unruly behavior has its weak points. First of all, it wasn’t the fans who decided to open just one gate. Which itself was a safety hazard. “”I think the cops wanted to have a bottleneck to catch the troublemakers. But something happened upstairs and even some officers were dragged into the falling crowd”, van Gelderen said. As a Dutch official he was helping HFC Haarlem logistically with the game. Ticket for the S Tribune, Sector 13, row 47, seat 134. Secondly, there were reports that icy staircases may have been a factor in the disaster. Just 11 years before the Moscow tragedy there was a disaster in Glasgow which may have begun with just one person tripping to cause hundreds of others to fall. This could suggest that despite moderate ticket demand organization efforts were insufficient. And thirdly, blaming hooligans seems a vague argument in a crowd so thick that moving an arm or leg is an issue. Here’s another link to the Glasgow tragedy of 1971. In that case it was initially thought that some fans leaving Ibrox began rushing back after late goal. This would cause two waves of people clash at the top of staircase no. 13. But eventually investigation established the tragedy in Glasgow had happened 5 minutes after the game, not right after the goal. Similar doubts were raised in Moscow, where pressured authorities gave the late 2:0 shot as the primary cause of disorder in the staircase. Except that in Glasgow the late goal changed the game’s score crucially, in Moscow it only increase Spartak’s victory. Besides, witness statements deny this was of any importance. “It’s untrue that the fans rushed back”, said Mikhail Kuzenkov, survivor of the “avalanche”, when interviewed by ESPN. “I was already on the ground before they scored. Some 3 minutes before the end we tried to leave, but after walking some 10 meters the crowd became very thick. Moving a hand or leg was impossible. I landed on the ground with everyone else falling on me. Somehow I pulled my arms under me, lost consciousness and survived”, he went on. Initial reports didn’t give any death toll, at best mentioning there were any casualties. Some reports suggest authorities went far to cover up the entire tragedy. Many families were given only 40 minutes to bid farewell to their relatives, buried in mass grave, and only on condition of keeping it a secret. Officially there were 66 casualties, all gathered in one morgue. Misha Novostruyev, son of a KGB major, was among them. His father Yuriy was there to see his son the last time, but he also had information of other victims in other morgues. Sceptics also point to the reported origin of the victims. As it turned out, all of the deceased were Moscow residents. Seems natural since this happened in Moscow? Perhaps it shouldn’t be. Moscow has for decades been a multicultural city with people from across the Soviet Union living there. And Spartak was a club drawing people from afar to games. Mikhail Kuzenkov, quoted before, claimed he was in hospital with 11 other survivors and only one of them was from Moscow. So how come there were no victims from outside the city? Unofficial claims suggest there may have been as many as 340-350 people killed that night. Such estimates are favoured over official ones by journalists of Soviet Sport, biggest sports gazette at the time. Their version has some supporters, though critics say the number is much exaggerated. Covering up so many deaths in such a short time would be too hard even for the Soviet authorities, claim the critics. On the other hand efforts by authorities to quell any remembrance of the tragedy are stunning. Only one of the “official” tombstones has any mention of the catastrophe at all. All funerals were secured by militia members and the graves monitored for years afterwards. October games were even banned at the stadium to prevent from any spontaneous demonstrations commemorating the disaster. It wasn’t until 25 years after the disaster that a monument was reveal to remember the lives lost. No apology was never issued.